Today, years 2,3,4 and 5 were visited by the Sikh Education Service. The day started with an assembly for all four classes, in which Mr Singh taught children about respect, integrity, how special we all are and performed a musical number for the children. The children really enjoyed interacting throughout the assembly. This was followed by interactive workshops for year 3 and year 4 for the rest of the morning. This week we welcomed Rabbi Aaron into school to share details about he and other members of the Jewish community celebrated Rosh Hashanah, Jewish New Year. He shared songs on his guitar, taught us actions and words and played the Shofar. 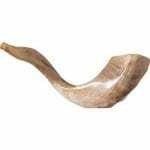 The shofar is a rams horn which is blown to make a loud sound. We look forward to welcoming more members of our Jewish and other faith communities into school over the year. Happy Rosh Hashanah to all members of the Jewish Community. KS1 will be learning about Easter this week. A simple Google image search just using the word ‘Easter’ will tell you that the true meaning of this, arguably the most important Christian celebration, seems to be being obscured by fluffy chicks and chocolate eggs. Whatever your religion, or even if you don’t have a religion, it’s important to respect the beliefs of other people by taking the time to learn about them. We will be using these resources amongst others this week. It was a pleasure to have a day full of learning outside the classroom with children who were so respectful and eager to learn about other cultures and religions. We were made to feel incredibly welcome and were given every opportunity to ask questions to further understand the beliefs of those among us. I was so proud of the attitudes shown by all children throughout the day and all that we have learnt will benefit us greatly going forward in our learning of the world and those that live in it. In RE, Year 4 started learning about Sikhism. They were asked to guess what could be in the parcel on their desk. They were brilliant at giving reasons for their thoughts and attempting to use their prior knowledge to make sensible guesses. Can you remember what was revealed? Y5/6 brought their RE learning to life by going on a trip to St Albans. We visited a synagogue first to learn about Judaism. The children gained first hand experience of how Jewish people worship and celebrate their faith. My group particularly enjoyed ‘Friday Night Dinner!’ Huge thanks to all the ladies from the synagogue for making us feel so welcome. Then, a short trip back to the Cathedral, lunch in the wind, then inside for a tour. We learnt about St Alban (the first Christian martyr), and the changes the building had gone through from its beginnings as a shrine to St Alban, to the grand Norman building we see today. A great day out. Year 5/6 – what interested you? I really hope everyone enjoyed a good sing down at St Thomas’ Church earlier today. I thought you were all in fine voice! At the end of the service, we read ‘Refuge’ by Anne Booth & Sam Usher. This is a beautifully written and illustrated re-telling of the famous nativity story. The donkey and it’s precious load simply needed the kindness of strangers when they were in danger: a very topical theme. Lots has been written, and many opinions have been shared about the plight of the refugees; it remains a contentious issue. However, what my class, year 5, unanimously agreed is that the children caught up in dangerous situations are innocent and really should be helped. This is why we took a collection for War Child at the end of the Carol Service. War Child is a charity that gives aid, support and education to children who are caught up in dangerous and frightening situations; whose lives have been torn apart by war. If you didn’t manage to donate at the end of the Service but you still want to donate, please see any member of staff and they’ll make sure your donation gets added. Also, if you’d like to buy the book, you can buy it online here. £1 from every book sold goes to War Child. You can get a sneak preview below. We had a wonderful visit to London and the historic Westminster Abbey. The children experienced a special tour and saw the Coronation Chair. We were able to stand together in a circle and sing as way to spread peace and joy! Each child was able to create their very own Westminster Abbey Christmas star to be hung up as a reminder of all that they learnt. The most special part of the day was hearing a special prayer for Maple Cross School read out to the whole of the Abbey! A wonderful day of learning. This morning, during our Religious Education lesson, Year 1 learnt about the Christian tradition of making christingles. They learnt about what each part represented in the Christian faith and were very respectful and understanding of differing religious viewpoints. They then worked systematically to create their very own christingles. If you see anyone from Year 1, ask them about what each part of the christingle stands for. Year 2 have been learning about a new religion and culture. Miss Ahmed taught the children about some of the similarities and differences between Christianity and Islam. The children saw inside a Mosque on an interactive video and even learnt to speak some Arabic words. Ask Year 2 what an ‘Imam’ and ‘Qibla’ are! It was a pleasure to learn about different beliefs and the children were very respectful of cultural differences. Everyone was asking questions and sharing their own thoughts.